After all these years Thunderbirds are still going strong in with a new Powertech Tracy Island designed to lift the lid on International Rescue! 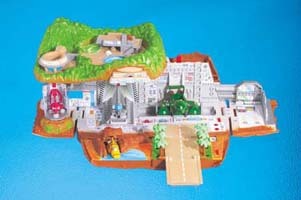 The inner workings of the Tracy Brothers HQ are revealed in the most advanced Thunderbirds playset ever to be released. Exploding into action, the Powertech mechanism creates an automatic opening sequence when activated, with the top and sides of the set moving into place to reveal the inner workings of the Thunderbirds HQ. Bursting with moving features and over 17 different sounds and phrases, Powertech Tracy Island recreates all the excitement of the supermarionation series. "ETA five minutes!" TB1 moves automatically into position for launch at the touch of a button as the swimming pool slides back ready for blast off while a moveable conveyor belt transports TB2 pods into position. "M M M Mr Tracy, detonation in four seconds!" Revealed in his secret workshop, Brains is hard at work planning the next mission, running each vehicle through its own talking launch sequence! Complete with vehicles, Powertech Tracy Island is about as much Thunderbirds fun as anyone can handle and at under £30 you'd be mad not to buy this. Possibly the best Thunderbirds toy on the market and certainly one of the best playsets.